Journalist Charlie Cates has always believed in facts, in what can be proved–her career depends on it. Which is why she has never truly accepted the supernatural visions that guide her to children in danger. After her work on a high-profile missing-child case brings unwanted fame, she reluctantly flees to the lush Big Island of Hawaii with her best friend, Rae. Determined to avoid her disturbing visions, Charlie begins writing what seems to be a harmless interview of a prominent volcanologist, Victor Nakagawa. But her hopes for a peaceful vacation are soon dashed by haunting dreams of a local girl who went missing six weeks earlier. In the small and sleepy town of Kalo Valley, Charlie and Rae come to realize that even paradise has its ugly secrets, and the Nakagawa family is no exception. In order to find the missing teenager and stop a dangerous predator from striking again, Charlie is forced to embrace the gift she has always tried to conceal. Meanwhile, someone is watching her every move, and the closer Charlie gets to the truth, the more distant her chances of ever leaving the island alive. Charlotte “Charlie” Cates and her fiancé Noah rescue a missing twelve-year-old boy. Charlie’s dreams lead her to Alex’s location and enable her to locate the missing boy. It’s not the first time Charlie’s dreams have helped her save a child, but this time her abilities have been made public by the media. She escapes the unwanted attention by spending a week in Hawaii on a working vacation with her best friend Rae. She has an assignment to write a profile about Victor Nakagawa who studies volcanoes. However, soon upon her arrival, Charlie begins dreaming of a local girl who has been missing for six weeks. Charlie learns the girl’s name is Lise and has a connection with the subject of the article she is writing. Charlie would like to just relax with Rae, but can’t ignore the fact that her gifts could help find the missing girl. 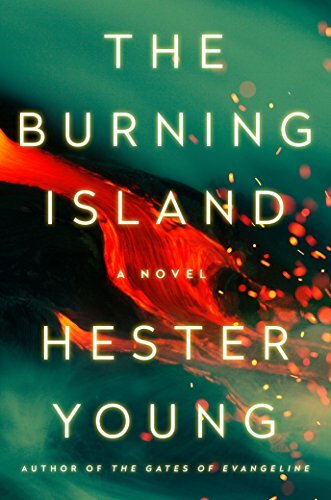 The Burning Island is the third in a series featuring Charlie Cates, but it reads like a standalone novel. I have read the prior two books, but it’s not necessary to read either of them to enjoy this one. The first book in the series is one of my favorite all-time mysteries, but the follow-up was disappointing. Although not as excellent as the first book, I enjoyed it much more than the last one. As much as I like Charlie and Noah as a couple, their immature interactions in the last book took away from the story. This time, the focus is on Charlie herself and she communicates mostly with Rae and the people they meet in Hawaii. The setting of each of the books in the series have been very different (Louisiana, Arizona, and now Hawaii), but all have added to the story. The sometimes horrible things going on in this book seem worse somehow set against the backdrop of an island paradise. The mystery is very interesting and the novel works well because Charlies doesn’t only rely on her dreams and visions to search for Lise. She and Rae research and find people who knew Lise and ask them difficult questions. Charlie learns some truly horrendous things during her search for the missing teenager. It would have been easier for her to walk away, but as a mother who has experienced the loss of a child, she won’t allow herself to turn her back on the search. I really enjoyed this book, especially seeing Charlie in a different setting and seeing the growth in her character. The reader is in store for many surprises before the book ends. Some are disturbing but are handled well by the author and by Charlie. In addition to the intriguing mystery, the book is as much about the search for Lise as it is about Charlie accepting her gifts and how to best help others while finding happiness for herself and her family. I don’t know if there will be additional installment in the series, but if not, this book ends on a hopeful note.